The High Plains region, together with the Rolling Plains, comprises the southern end of the Great Plains of the central United States. 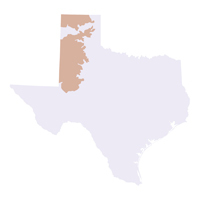 The High Plains is a relatively level high plateau, separated from the Rolling Plains by the Caprock Escarpment. Elevations range from 3,000 to 4,500 feet above sea level. Native vegetation of the High Plains is shortgrass prairie dominated by buffalo grass. Historically in a grassland, immense herds of buffalo and pronghorn antelope once thundered across vast prairies of blue grama and buffalo grass. Today, the plains are mostly irrigated cropland and the native vegetation includes more mesquite and juniper. Although much of the shortgrass prairie and the vast prairie dog towns are gone, large flocks of wintering waterfowl still come to the playa lakes (shallow, round depressions which spot the surface, sometimes covering more than 40 acres). These plants have been identified as particularly worrisome terrestrial invasive species in the High Plains ecoregion. Click on their scientific names to go to the Invasive Plant Database and learn more.